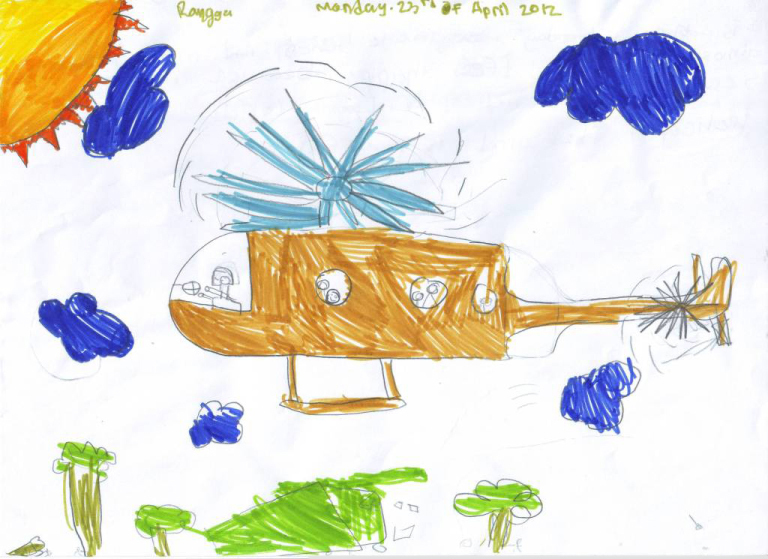 Kalimantan Gold Corporation is on the move... see the article in this issue... one symbol of the new era was the landing of a helicopter in Rungan Sari... a great event for the children at BCU School who made drawings such as the above... Mansur Geiger writes... "The kids' drawings record the first landing at RS of our helicopter which marks the start up our KGC new and major drilling program in the concession 250km to the north. Things are now seriously underway, our base camp is built and construction crews have been dropped into our remote drill sites. We had a big selamatan with the villagers. This was a memorable event as I met up with locals who first helped me 32 years ago... they were all kids then – now they grandparents, which makes me feel a little old…"